Ahead of academic staff staging a walk-out over pension conditions, Angus Satow urges students to support their struggle and places the dispute in a wider context around higher education. Pensions aren’t the most thrilling of topics, but sometimes they’re important. Universities UK (UUK) is attacking academic pensions, taking away university staff’s right to a defined retirement income and making it instead dependent on the performance of the market. The average lecturer could lose up to £200,000 over the course of their career. There is nothing inevitable in all this – it is part of a wider project to marketise higher education, in which senior university management make fortunes, while the state slashes funding, leaving students indebted and university staff struggling financially. The upshot in this case is a precarious workforce in competition with each other for financial security. University workers are determined to resist. Last week, members of the University and Colleges Union (UCU) voted overwhelmingly for strike action, with record turnout in the ballot. In February and March, university staff across the UK, including Cambridge, will withhold their labour to defend their pensions. For students, this means many lectures and classes – and some supervisions – will be cancelled. This poses the question to students of whether we show solidarity with staff or cross picket lines. 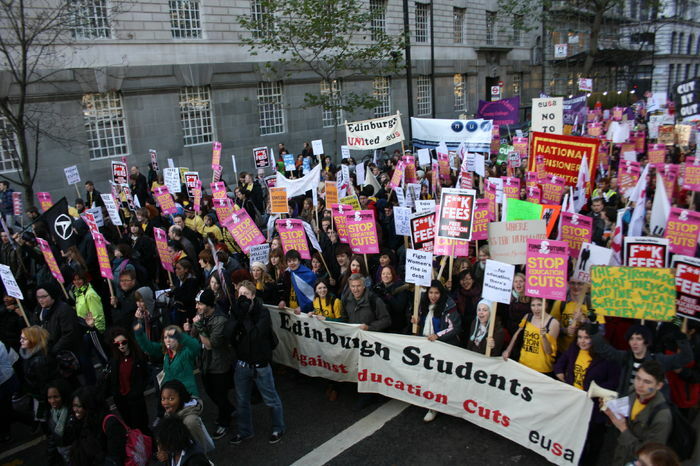 The UCU has consistently stood up for students’ rights, repeatedly opposing tuition fee rises. Now we too must take a stance. Some initial responses have mounted a knee-jerk defence of our perceived self-interest: missing classes by refusing to cross picket lines would harm our learning. Some even speak of our ‘value for money’ being eroded. This plays right into UUK’s hands. Strike action is a last resort, and its effectiveness relies on its disruptive impact. The greater the disruption, and the louder the noise, the better the chances of forcing UUK to back down. United, we stand; divided, we fall. There’s also a larger question at stake. Government reforms to higher education are dangerous, but they are also boring. In all the talk of pensions, marketisation, surveys and Teaching Excellence Frameworks, it is easy to lose interest. But in truth, what is going on in higher education is simple: the government is trying to make it entirely capitalistic. None of this would be possible without the efforts of successive governments: (New) Labour, the coalition government of 2010, and now the Conservative government. By introducing tuition fees and creating a tiered system of universities which may offer differing fees, the government has sought to make us into consumers shopping for a degree (the degree seen merely as a passport allowing access to employment). This is the Conservative vision for society. A dog-eat-dog world in which we ruthlessly compete against each other for success. In Thatcher’s infamous words, “there is no such thing as society”. The Conservatives want to commodify and individualise, but above all, they want to abolish the central achievement of the post-war era: public services for the public good, beyond the principles of the market. So when students say that strikes decrease our ‘value for money’, they reinforce a consumerist system opposed to the interests and mission of the university. Yet there is an alternative to the dismal capitalist vision of our higher education system. Happily, it is a vision many students and academics share: a commitment to knowledge in and of itself. These pension reforms will dramatically worsen the lives of our lecturers in retirement and discourage people from academia, already a profession dogged by stagnating pay and chronic overwork. By showing solidarity, students help present a common front for a just higher education system, one distinct from the market. Solidarity shouldn’t just be a matter of thought, but action too. Students should not cross the picket lines of our staff. Instead, they should visit them and show their support. In the coming days, Cambridge Defend Education will launch an open letter to the Vice-Chancellor, urging him to speak out against these changes, part of wider signs of protest and solidarity across the country. We should show solidarity with our feet and our signatures.